I’ve been cooking this recipe I found one day in Taste magazine for many years now. At the time it was a combination of foods both Ben and I had never really eaten but when we did, oh my goodness! It’s now one of our favourite dinners we cook on a regular basis and is equally loved just as much by our kids. It’s super simple to make and bursting with flavours and with the crunch of the potatoes this will soon become a regular dinner in your home too! 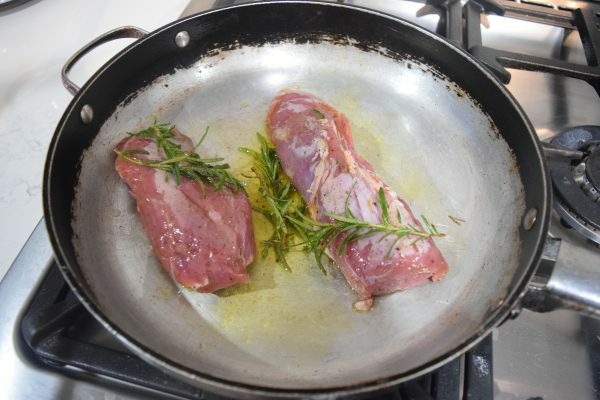 Place pork fillets in a bowl with half of the garlic and rosemary. 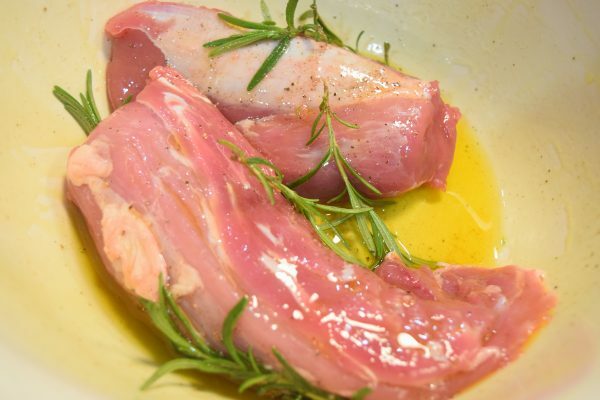 Marinate with 1 tablespoon of olive oil. Par boil the potatoes for 10 minutes. Drain and lightly crush. 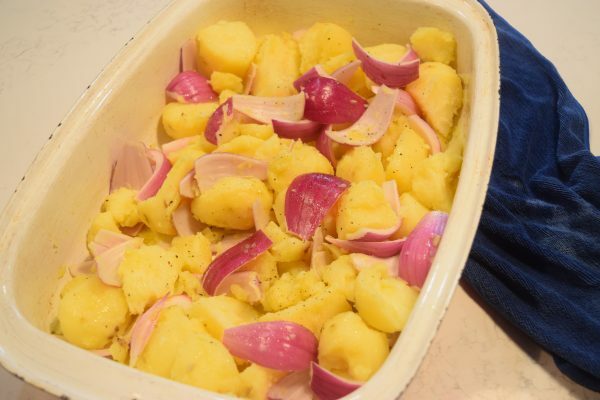 Toss the potatoes and red onions together with the remaining garlic and rosemary. Place in a baking tray and roast in the oven for 35 minutes, tossing after 15 minutes. While the potatoes are roasting away, heat oil in a large frying pan. Add pork fillets cook for 2-3 minutes on each side until lightly brown. Season with salt and pepper. Remove the pork from the frying pan and add to the baking tray with the potatoes and onions and cook for a further 20 minutes. In the remaining 5 minutes add the prosciutto to the baking tray and allow to crisp. Meanwhile it's time to make the balsamic dressing. 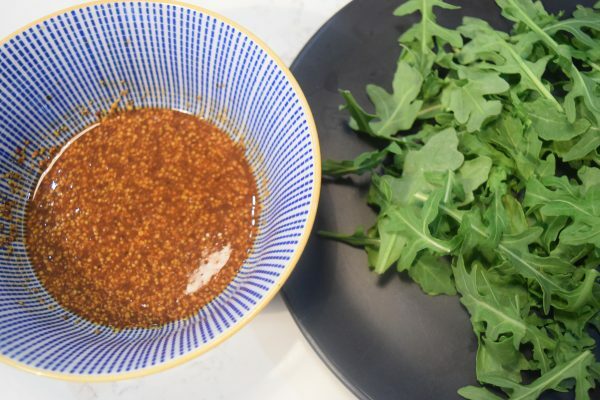 Simply combine all ingredients in a bowl and with salt and pepper and stir well. 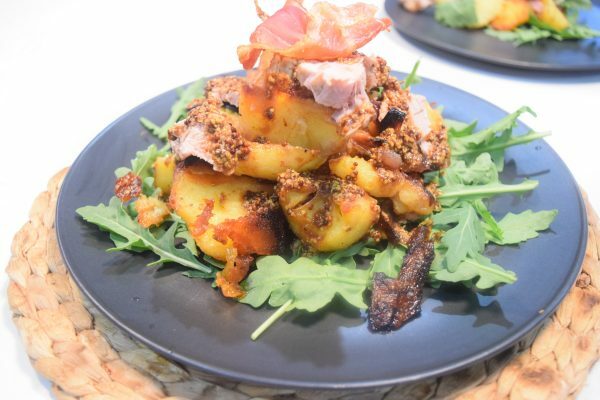 Place rocket on each plate and divide the potatoes and onions between them.Thinly slice the pork and place on top and drizzle with balsamic dressing. Add prosciutto to the top of the dish and your ready to eat! 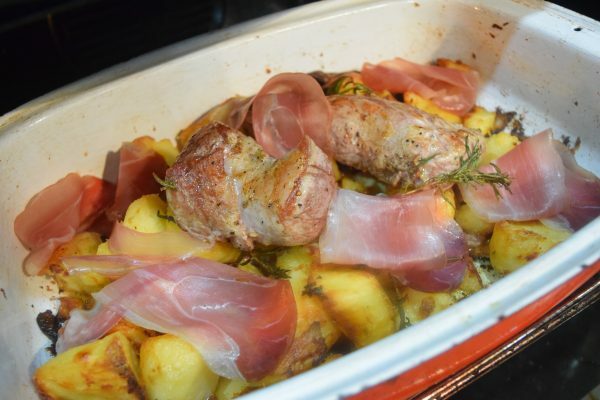 This entry was posted in Blog, Recipes and tagged organic pork, organic potatoes.